Being in the candy business for so long as we have you sometimes catch yourself just thinking about certain candies or gums or something along those lines. Well, the other day we were discussing creating a gift basket for O'Ryans Village focusing on gum. So we started tossing around the names of all the different gums that would fit the idea of what we had in mind for this gift basket. So here are some of the varieties that we've come up with. Let us know which ones you think should be included, and more importantly, ones that we haven't included that you think might be fun to have in the new gift basket. We of course will be featuring the brands from our Old Time Gum page. 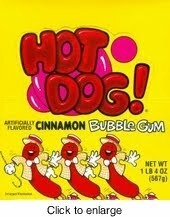 Bazooka (Joe): This all American bubble gum is a must and was the first brand that came up for inclusion. This chunky block of pink bubble gum is as iconic to gum as freedom is to America. It is such a simple pleasure with it's texture, aroma, and flavor that one can't help but to work it around bringing all the flavor out just to get to that moment of truth. The bubble. How many of us have peeled the remnants of this treat off of our faces after the triumph of the big bubble has popped? The bubble is not the only treat of this gum. From the colorful wrapper to the tough guy image of Joe himself and of course the silly jokes found inside all come together to tell us that this is serious gum fun! Rain-Blo: One of my favorite gums as a kid. I loved the big round, almost jaw breaker shape of this gum with each pack containing the different flavors. There was always a selection process when I bought some Rain-Blo. Which flavor to pop into my mouth first? It was all about that candy coating that gave you the big rush of flavor right from start. I usually grabbed the yellow one with the red polka dots first. Don't know why, just did. I was never disappointed with Rain-Blo, just a little bit of cash and it would go all day. There never was a lot of marketing behind Rain-Blo, just a lot of good fun and flavor. Razzles: This stuff blew us away when it debuted in the 70's. There were candies and suckers that were candy and had gum in the middle once you got through the candy. But Razzles were candy that you would grind up in your mouth like a Sweettart or a Wacky Wafer, but instead of disappearing in a couple moments, it turned to gum! Not a huge piece, but you had gum now. So the process was, keep eating the candy on top of the gum in your mouth and you just kept getting more gum. Awesome! These guys should've got like the Nobel prize for cool or something we thought, if there were such an award. This treat still behaves the way it did then and is now available in Tropical too. Hot Dog Gum: What a classic this is. Cool Hot Dog shaped gum that goes through a flavor transition as you chew it. Kind of sweet apple to spicy cinnamon. I think. I can't explain it, you'll just have to try it if you've never had it. Not the best for bubbles, but what a flavor. And you get two pieces in each tube so you can experience it twice. As far marketing for this gum, who doesn't love the crazy dancing hot dogs on the box? Never noticed? They've always reminded me of the treats that did the tantalizing dance for me during intermission at the movies. Honorary Mention. I love the C. Howards scented gum, but.... that scent would overpower all the rest. These are in a class and box all their own. Ok, so of course I didn't list them all here. Just a teaser of what will be going into our new Old Time Gum gift basket. Let us know what you think. We Said "The Outdoor", He said "The What?" Review: Black Cow is Back!